One day I’ll make some items for a Frankenstein’s laboratory scene. I saw these lamps on eBay. for about $4 each. They have an E27 base and are 110V. A 240V version is also available, but would require too much voltage to light at all. 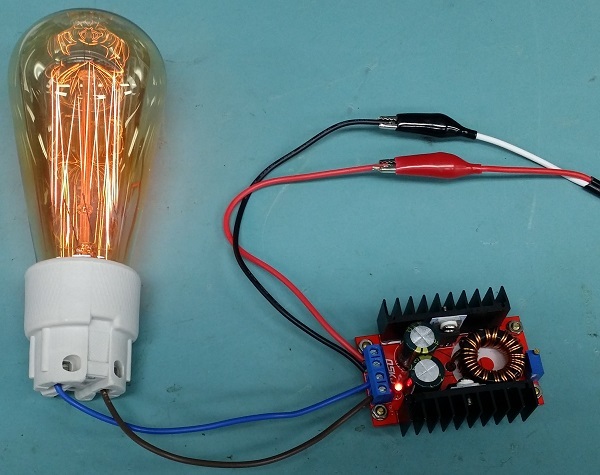 The idea is to get a nice glow at the lowest possible operating voltage. This boost converter module was $6.60 on eBay. The input can be from 10V to 32V. I will probably use 12V. 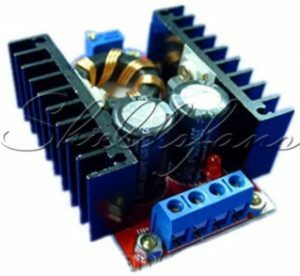 The output is adjustable from 35V to 60V. I’ll be running the lamps at 50 – 60V so they have a dull vintage glow. This way the prop can still be powered with a safe, low voltage. Here is the lamp running from the boost converter module. The output voltage was set to a shade under 50V. 10.5V but I’ll more than likely be using it with a 24V input. The golden glow should look great in a Halloween environment.